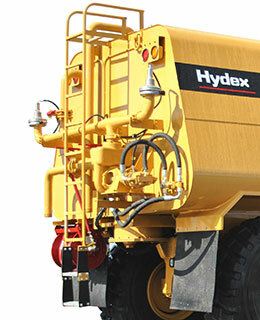 The Hydex WT range is a complete line of water trucks from Articulated Truck Solutions. 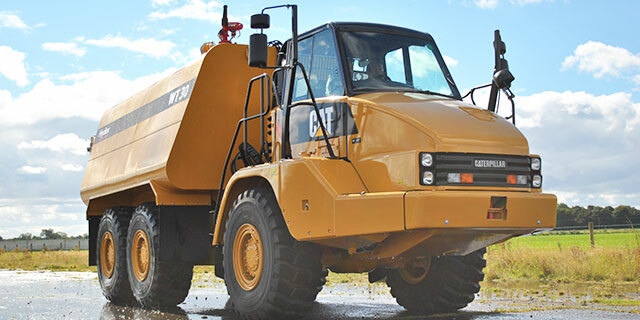 More than just a water tank, it’s a water truck; an integrated machine designed for dust suppression on the most demanding mining, quarrying and construction sites. Supplied on a new CAT® chassis directly from our facility close to the world-wide Caterpillar® ADT factory or, for used equipment, it can be fitted at your local CAT® dealer with the supervision of one of our own engineers. So whichever way you buy your water truck, you get a complete machine to factory standards with the parts and service you expect. Tank design for maximum visibility and lowest centre of gravity. Flanged Bulkheads welded 100% inside and outside for superior tank strength. Multiple rows of flanged baffling in both transverse and longitudinal directions. 1500 GPM hydraulic driven centrifugal pump. Rear spray bar to include up to four fully adjustable fan spray heads with individual cab mounted hydraulic controls. Two spray heads mounted on front of tank for side sprays with individual cab controls. Self loading system which allows for suction from a water supply. Remote controlled turret water cannon, with the control panel mounted within the cab. Full width gravity bar with in cab control. Hose Reel with 100’ x 1 1/2” hose including straight nozzle. Interior of tank coated with Epoxy or Plexiblack. Water level gauge in operator cab. Fire Eater system; includes built in Stainless Steel foam tank, and adjustable nozzle for water and foam. Safety railing on tank top from access ladder to manhole. Rear spray bar with staggered fan sprays. Extensive range of options available: side sprays, hose reels, water cannons, gravity dumps. Why choose a Hydex Water Tank Truck?